Don't let your tired gaming world just fall by the wayside. Bring it to a world-shattering climax! Apocalypse is a complete gaming source designed to help you bring your campaign world to a conclusion or move it into a new era. 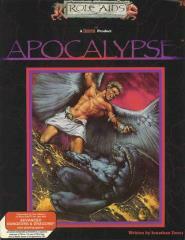 ...the Apocalypse Game Master's Book, containing extensive details on all manner of apocalypses and how to incorporate them into your campaign, from the simple ending of an era to the complete and utter destruction of the world. ...Tumult and Tribulation, a massive adventure describing all the details of an apocalypse which you can end your campaign world with or run as a separate, apocalyptic campaign. ...dozens of detailed maps, pre-generated characters and NPCs for your characters to encounter in their cataclysmic adventure.